The human head is of the same approximate size and weight as a roaster chicken. I have never before had the occasion to make the comparison, for never before today have I seen a head in a roasting pan. But here are forty of them, one per pan, resting face-up on what looks to be a small pet-food bowl. The heads are for plastic surgeons, two per head, to practice on.... "Isolate the brow as a skin island." The [instructor] speaks slowly, in a flat tone. I'm sure the idea is to sound neither excited and delighted at the prospect of isolating skin islands, nor overly dismayed. The net effect is that he sounds chemically sedated, which seems to me like a good idea. An eye cap is a simple ten-cent piece of plastic. It is slightly larger than a contact lens, less flexible, and considerably less comfortable. The plastic is repeatedly lanced through, so that small, sharp spurs stick up from its surface. The spurs work on the same principle as those steel spikes that threaten Severe Tire Damage on behalf of rental car companies: The eyelid will come down over an eye cap, but, once closed, will not easily open back up. Eye caps were invented by a mortician to help dead people keep their eyes shut. There have been times this morning when I wished that someone had outfitted me with a pair of eye caps. I've been standing around, eyelids up, in the basement embalming room of the San Francisco College of Mortuary Science. By and large, the dead aren't very talented. They can't play water polo, or lace up their boots, or maximize market share. They can't tell a joke, and they can't dance for beans. There is one thing dead people excel at. They're very good at handling pain. For instance, UM 006. UM 006 is a cadaver who recently journeyed across Detroit from the University of Michigan to the bioengineering lab at Wayne State University. His job, which he will undertake at approximately 7 p.m. tonight, is to be hit in the shoulder with a linear impactor. 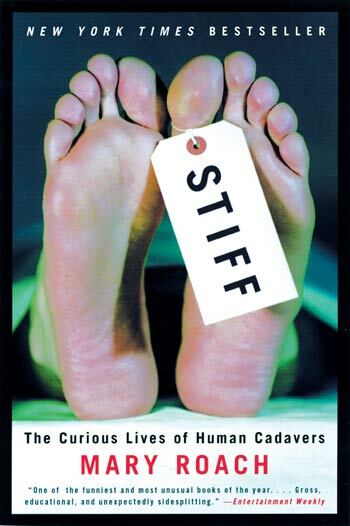 A patient on the way to surgery travels at twice the speed of a patient on the way to the morgue. Gurneys that ferry the living through hospital corridors move forward in an aura of purpose and push, flanked by caregivers with long strides and set faces, steadying IVs, pumping ambu bags, barreling into double doors. A gurney with a cadaver commands no urgency. It is wheeled by a single person, calmly and with little notice, like a shopping cart. H. is unique in that she is both a dead person and a patient on the way to surgery. She is what's known as a "beating-heart cadaver," alive and well everywhere but her brain.